P. Rigdon King, son of Samuel L. King of this town, who has been in the hands of the rebels as a prisoner since Gen. Banks’ retreat from Strasburg in May last, returned to his home recently. 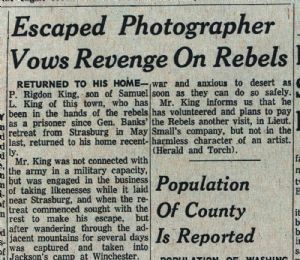 Mr. King was not connected with the army in a military capacity, but was engaged in the business of taking likenesses while it laid near Strasburg, and when the retreat commenced sought with the rest to make his escape, but after wandering through the adjacent mountains for several days was captured and taken into Jackson’s camp at Winchester. Wien Jackson’s army retreated from Winchester, he was taken South with the other prisoners and like them received the most cruel and inhuman treatment from the rebels, having been furnished with scarcely enough food to keep body and soul together and that of the most revolting kind, and marched 25 and 30 miles a day. He gives a very deplorable account of the manner in which our prisoners are fed and lodged by the rebels, but we have not room to write it in detail. He managed to pass himself off as the 2nd Lieut, of a Wisconsin Company and as such was included in the recent exchange of prisoners. If he had not done this, he would probably have had to remain until the close of the war, as there seems to have been no arrangements made for the exchange or release of persons not connected with the army. William H. Protzman and J. H. Duffy, both citizens of this town, who were in the employ of Mr. Mong and who were taken at the same time that Mr. King was, are still at Richmond and as civic prisoners may have to remain a long time. Mr. King represents the Hagerstown boys in the rebel army, Cramer, Shirey and others, as heartily sick and tired of the war and anxious to desert as soon as they can do so safely. Mr. King informs us that he has volunteered and plans to pay the Rebels another visit, in Lieut. Small’s company, but not in the harmless character of an artist. (Herald and Torch). In view of the approaching draft and the percentage of fighting material it will extract from our population liable to military duty, some anxiety has been expressed to know the exact number of inhabitants in Washington County. The total population of the county is about one-seventh of that of the City of Baltimore. The Baltimore American estimates the quota of the city under two recent calls of the President at 5600; 2800 volunteers and 2800 militia.